Last Monday, I took the bus from Iraklion to Anogia (Anoyia) into the Mountains of Crete. 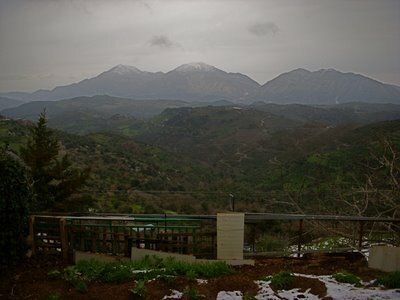 Anogia resides beneath the highest mountain peak of Crete. I experienced a wonderful welcome and received more than what I asked. It was slightly rainy riding into town, but the mountain area just above was covered with snow. If there were no cars in town, I would have thought the bus ride was a time machine, were talking about 40 years formerly. The bus dropped me off in the lower city. 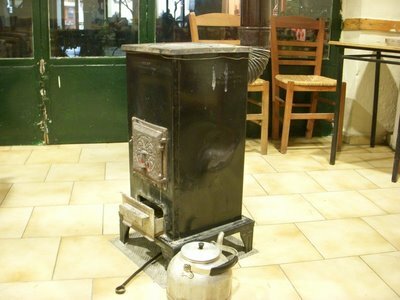 I stepped into this coffee shop, several old men sitting at the table playing cards, the heating stove in the middle of the room looked as if it were handmade, but throwing out heat from the burning wood. A young person was in the room, and I ask about the hotel I noticed in the book (I did acquire a rough guide for Crete for free). 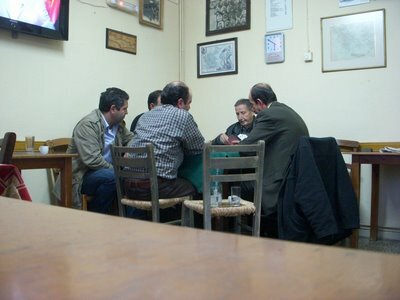 The old man of the smoky, wood burning heated male cafe offered me tea, and the young person paid for it and escorted me to the hotel up the hill to the upper city. The hotel owner, Grandma Arisitea, who owns the Arisitea hotel, is the most comical, pleasant, hospitable host. First, I had to bargain for the comfortable room, what a comical experience, it reminded me of Urgup in Turkey. Grandma Arisitea started at 40 Euro a night, my reaction is to moan and groan, she brought it down to 35, I moaned some more, and then she asked me what price. This whole interaction happened on the wall of the door-frame of the room, she spoke little English—we wrote the numbers with our finger on the wall. I said 30 euro, she patted me on the back, and we both laughed over the transaction. I gave Grandma Arisitea my passport, she would hold as collateral, although since I paid her for the room she gave back my passport, another comical tactic. 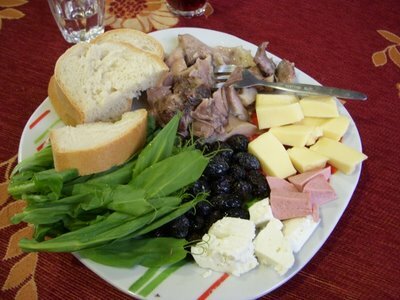 She insisted on serving me tea, so I went up to the main house, and instead she served me lunch and booze consisting of homemade red wine, I poured a little in the glass to taste; oops, wrong move, she took the bottle and filled the glass; in addition, she insisted I finished everything. She got the point across that the wine will warm me up and put me to sleep. After serving me lunch, she sent me to my room with black cinnamon tea with sugar (just the way I like tea) and a fourth loaf of homemade pound cake. Grandma Arisitea is a wonderful warm person; we enjoyed a bunch of laughs even though not much English was spoken. 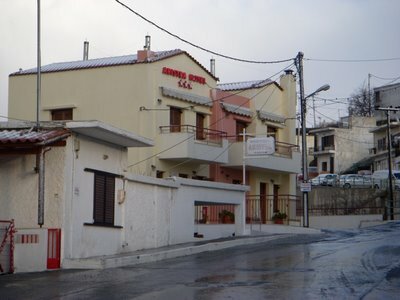 The average price for the room in high season starts at 45 Euro a night. Also, while I was having lunch it started to snow—large snow flakes started falling from the sky of the mountain in blizzard fashion, just a wonderful treat. One these winters I would like to find a small mountain village to nest for the season. I enjoy the winter as long as there is efficient heat and hot water, although I would want to avoid an area that salts the streets. Anogia is the style of Mayberry; I am referring to The Andy Griffith Show. I am a Mayberry style type of person. 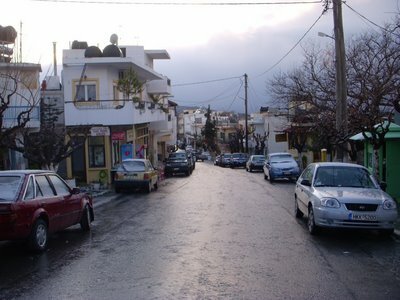 Anogia is on my top three favorite towns; it is slow, traditional, hospitable, amiable, and easy going. 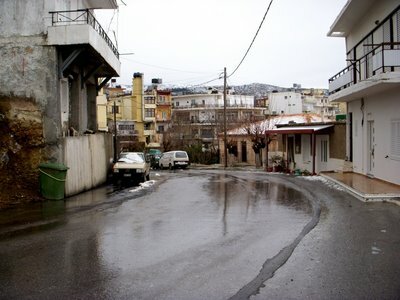 A village, such as Anogia brings a person back 60 years to the quality of life—fresh tea, homemade liquor, traditional quality cooking; western imperialism is ruining good quality into processed garbage. However, difficult time going back in time—life is more difficult to deal with without electricity. I do not have a favorite country; each country is unique in itself. Even so, I do have some favorite towns, starting from last to first: Al Qasr in Egypt is a historically and culturally Ottoman town with an interesting Egyptian/Bedouin personality. Urgup in Cappadocia stands in the third spot in Turkey. Amasya drops to number two in Turkey; Amasya is a picture square beautiful town residing along a river ravine surrounded with mountains. 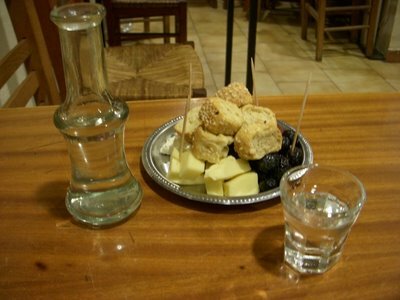 Anogia on Crete now is number one; Anogia is a place of hospitality and tradition that is unforgettable and impressionable. Anogia comprises of a unique and rare personality, everyone on Crete has commented about the tradition in Anoyia. Every coffee shop that I entered and ordered tea someone bought upon my first visit, and the owner offered Ra’ki on the house in Angoia. The temptation is upon me to visit again in April—I will be posting a tentative plan regarding the spring, summer, and autumn travel route soon. I would like to reveal how this idea took place to visit Anogia. When I was at the bus stop in Ierapetra, I visited with a couple from Holland. It is easy to strike up a conversation—I asked where are you from? They expressed that they have been to Crete, and the only town he adverted to visit was Anogia. 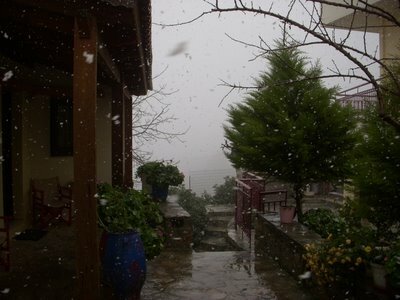 I felt deep within that Anogia was the destination despite the cold, rain, and snow. Indeed, traveling in the cold, rain, and snow is more challenging, but if a person cannot handle it—stay at home. What can help is playing the Grateful Dead song Cold Rain and Snow. The Grateful Dead are so Dead they are Grateful—it’s an original. There is a lot of history concerning Anogia, I will try write a post about the history. Also, I will be posting about Knossos soon. I'm so glad to have found your blog. I'm not a fan of beaches and prefer to explore traditional villages. Anogia is now on my must-do list! Next post: A Tentative Plan—2009. Previous post: The Greek Weather Report.